On July 19, 2018, we celebrated yet another milestone of Transformation Main! 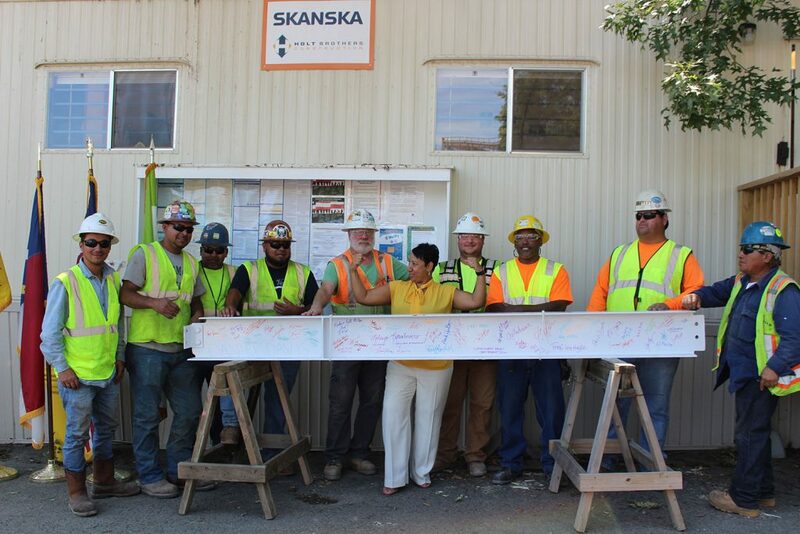 The Topping Out Ceremony was an event that allowed an opportunity to acknowledge the hard work of the Skanska Holt Brothers construction team. Together with Vines Architecture they are making the dream of Transformation Main a reality. It was a privilege to be among County Leadership & Officials, the Library Family of Friends, Foundation, and Board of Trustees members, as well as library staff. Library staff continue to work tirelessly in preparation of Main opening in early 2020. Additionally, Peri Manns & Brenda Hayes-Bright with County Engineering have offered a great deal of support every step of the way. They are to be commended for working closely with Library staff to make certain that we are all on the same page. I’d be remiss if I didn’t also recognize the hard work and passion for Durham County Library of past directors, Dale Gaddis, Phillip Cherry, Priscilla Lewis, and Skip Auld. They have each paved the way for our success and for that I say thank you. Thank you for your support of Durham County Library and fully understanding the voice of Henry Ward Beecher, “A library is not a luxury but one of the necessities of life.” We take our responsibility to the community seriously and are committed to all around excellence regarding facilities, programs, and other resources. We will continue moving forward as a library that represents the living room of all individuals of Durham County.